Eliminating secondary operations in sheet metal fabrication has been saving companies time and money for decades. The use of forming tools in a punch press has been eliminating secondary bending operations for the same amount of time. The addition of simple forms such as extrusions, embosses, and countersinks to a piece of sheet metal in a punch press can eliminate the need for those secondary operations as well as reduce the amount of handling time for these parts. These all add up to reduced costs, or more importantly, increased profitability. More complex forms can also be produced in a punch press. Features such as louvres, thread forms, and tapped holes now are relatively easy components to create in a punch press. The newer tooling deisngs combined with precision stroke control of the latest punching machines help ease the creation of these more complicated forms. (see Figure 1). A hinge is an example of a more complex form that can be processed in a punch press without difficulty. With today’s machine technology, like punch presses with stroke control, hinges no longer need to be a headache to produce. By using a hinge tool on the punch press, fabricators can form many different types of knuckles with varying lengths and diameters. Metal enclosures and similar cabinetry that require hinges can be fabricated with integral hinge knuckles. Forming a successful hinge in a punch press is a process that typically involves two forming tools, Hinge Tool 1 and Hinge Tool 2 (also referred to as the “knuckle tool”), and three forming strokes. These forming tools are in addition to standard punching tools used to create the tabs for forming. After the tabs have been punched in the sheet to be formed, Hinge Tool 1 is used to make the first two forming strokes. This first form produces the leading edge of the tab (see Figures 2a and 2b). The second forming stroke is added to all tabs to be formed. This forming stroke is determined by the amount of material needed to make the hinge and bends the tab up to a designated angle (see Figures 3a and 3b). The spring-loaded lower assembly, or die, pushes the sheet off the lower insert before it advances to the next forming location. The final forming stroke uses Hinge Tool 2, or the knuckle tool, which curls the angled tab to form a hinge (see Figures 4a and 4b). This tool also includes a spring-loaded lower assembly to life the material off the lower insert before advancing it to the next forming location. Forming hinges on the punches machine delivers some immediate benefits for any metal fabricator. 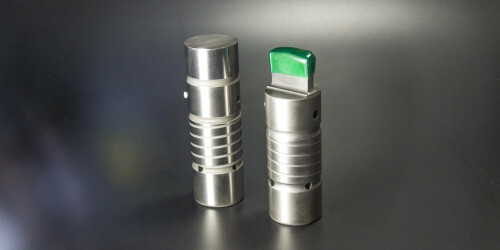 The show no longer has to worry about separate hinges, fasteners, spot welds, or other downstream assembly operations. Accuracy also is improved because manual labour is removed from the forming equation. Forming the hinge of the punching machine also eliminates the cost and maintenance requirements for specialized press brake or stamping tooling. All this contributes to a much leaner manufacturing process (see Figure 5). Fabricators also should take into consideration the material they will be punching, its hardness and ductility. Both will have an effect on the result of the final form requiring press and tooling adjustments. For example, stainless steel is harder to form, especially in tight diameters. This requires reduced ram and machine speeds. Material grain direction also may have an effect on the final forming result. Forming with the grain may produce slightly different results than forming across or against the grain direction, requiring modification. Additional tips include a slower feed rate to give the material more time to recover from the previous form and to ensure accuracy of the next form. A programmable dwell command may be added to allow extra time for the material to form and strip properly from the tool. Lubrication is also essential, especially directly on the formed tabs to help them slide smoothly around the inside diameter of the knuckle tool; this is especially helpful in the production of stainless steel hinges. There has been major improvement in how today’s metal fabricators understand and use forming tools in their punch presses, with hinges being a good example. Informational resources, such as CNC punching forums, blogs, and YouTube videos, have helped to spread the gospel about the usefulness of hinge-making inside a punching machine. Presses are precision stroke control have given fabricators the confidence to invest in this type of tooling. Even something as simple as a tooling manufacturer’s use guide can make a big difference, This type of document details the setup procedure for components and steps required to create a hinge form in a punch press, complete with screen shots and photos of the process. The troubleshooting section provides photos of hinge forms that are good and less than perfect with tips for correcting the form. Application technicians and specialists also are available to assist fabricators when they purchase their hinge tools. A fabricator doesn’t have to troubleshoot an application alone. For example, a fabricator was having trouble creating good forms with a set of hinge tools. The forms are not consistent. After a series of phone conversations and example exchanges with the tool supplier, the tool was returned for evaluation. The stripper of the second tool (knuckle tool) showed damage consistent with the die being loaded 180 degrees off. The stripper was remade and the tools were tested before being returned. The fabricator transferred the information for the hit locations to its part program and has been fabricating successful hinge components ever since.